This is the final weekend of Easter school holidays, starting with some rain, lightning and thunder, it seems like perfect weather to treat the family with hot cross buns for lunch. 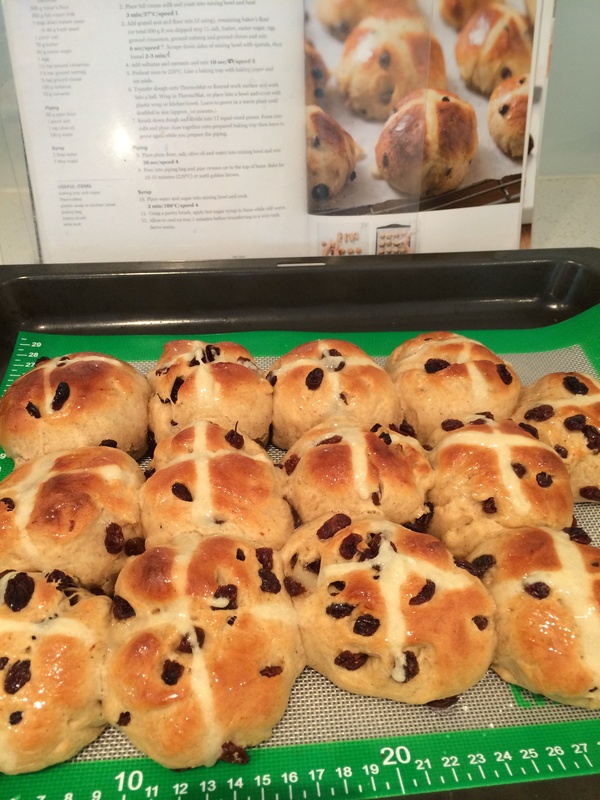 Using the thermomix guided recipe from the Basic Cookbook, we are rewarded with these impressive looking scrumptious hot cross buns. Previously we had looked at the recipe and been put off by the extra elements of making the cross mixture and glaze but these were literally a ‘ piece of cake’ with the thermomix and they were ready in minutes. Kneaded dough in thermomix for 3 minutes instead of 2 minutes ( note BCB cookbook states 2-3 minutes, guided mode is set for 2 minutes ) , then left in the TM bowl to prove until doubled in size. It took longer than the recommended 1/2 hour, more like an hour because of the temperature drop coming into NZ cooler weather. Lemon zest (optional) and ground cloves were excluded because we had neither in the pantry. This didn’t effect the end result. Hot cross buns buttered for weekend lunch. Super yummy and better than anything we’ve ever bought. It’s starting to feel like any time the Thermomix is on the bench there should be something proving in it because a lot of these breads, rolls and baked goodies could be frozen and taken out for school lunches during the term.